At first glance, it was definitely a disappointing 4th quarter for Mudajaya to sum up the year 2012. Revenue and PAT dropped at a 30% rate y-o-y. 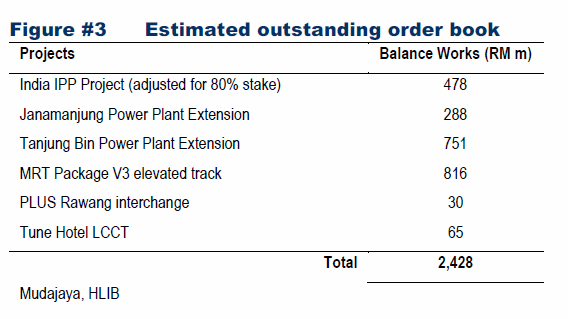 Based on the report's note, the lower revenue and PBT for the current quarter was mainly due to decreased delivery of equipment components for the 4x360MW coal-fired power plant in India. Revenue in terms of segment, trading & plant hiring and property development recorded an improving trend. But that was being dwarfed out by the construction segment which represents more than 90% of Mudajaya's revenues & net profit, recorded a lower net profit. Full year revenue increased 23% but PAT only increased marginally. This caused the net profit margin dropped from 17% to 14.3% for year 2012. Full year EPS increased marginally to 43.11 sen. PE is around 5.6 based on today price of Rm2.40. ROE for year 2012 dropped from 24.4 to 21.0, still >15. Full year dividends increased to 9 sen from 8sen last year. This translates into dividend yield of 3.75%. Management team only distributes around (9/43.11) 20% of net profit as dividends for this year. Still remains cash rich with RM340m in hands. This translates into Rm0.62 cash per share. This is vital for its expansion or investment in future. Current ratio remains good of >1.0, which shows good liquidity. Share premium is as twice as share capital while retained earnings are 7 times more than its share capital. There is possibility a bonus issue will be held in future. 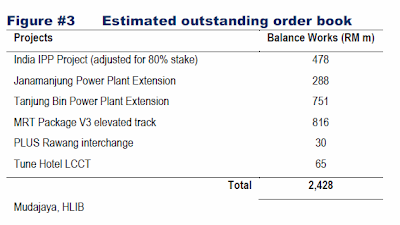 Mudajaya still has an extensive amount in order book. Source: HLB. In short, Mudajaya still remains in my monitor list. No matter which party take charge of Putrajaya after the upcoming election, construction segment still considered as one of the areas where the new government will concentrate at. In terms of power plant construction, I do think Mudajaya will stand out against its competitors. Perhaps, the next market crash or correction will be a good price to enter.